The Kankali Temple at Tigowa dates from the 5th Century, Gupta period and represents an early example of structural temple architecture of that time. The typical features of this period are the small square sanctuary with a flat roof and the adjoining porch with columns. 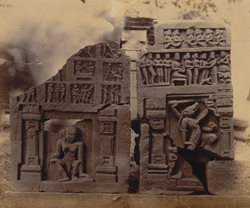 The figures carved on the slabs in this view represent the goddess Kali and Vishnu as Varaha rescuing Bhudevi set in niches framed by pilasters with pot and foliage capitals. Over the figure of Vishnu there is a fragment of a panel depicting the myth of churning the milk ocean by the gods and demons.